I have just completed a commission for Museums Sheffield. I was briefed to shoot a timelapse video of the creation of a new wall painting by Paul Morrison, as part of his new solo exhibition, starting 7th June 2012. Given the amazing contrast between the previous show, The Family in British Art, a traditional touring show of mostly dead artists, and the new one, a sparse contemporary show by a living artist, I suggested that as well as recording the wall painting it would be a great opportunity to shoot the transformation of the space from one exhibition to a radically different one. Sounds like a great idea? Well, it is. However, not only had I offered two edits instead on one, but I had more than doubled my shooting schedule. Anyway, it was a great opportunity to not only record the transformation, but also show just how much work it takes, and how many people are involved, installing an art exhibition. 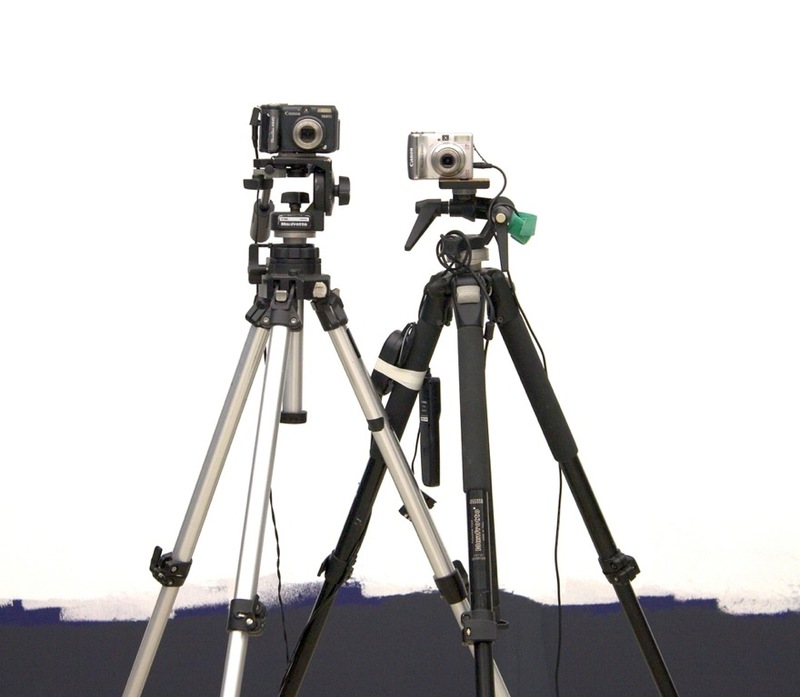 There are many problems associated with photographing works of art, not least the technical. You are probably familiar with the ubiquitous “No photography please” signs in galleries, and that is because of intellectual property rights. As an opportunist, documentary photographer I want to shoot everything. No really, EVERYTHING! But it’s not that simple. We were able to negotiate specific permission from the National Portrait Gallery to photograph The Family of Sir Thomas More, (c. 1594) by Rowland Lockey (after Hans Holbein the Younger), but many of the other works on loan could not be photographed except in general wide shots. Working in observational documentary filmmaking I have only been asked not to photograph a person on two previous occasions. Most people are not that bothered but as a professional I have to respect the wishes of the subject. You could not meet a more friendly and accommodating person as artist Paul Morrison, but he doesn’t like to be photographed, at least not closely. That is his right but it makes it hard for a commissioned filmmaker documenting his activity. The compromise we came up with is the single long-shot which I have varied a bit in order to make the video engaging for the audience. Another elusive element was the action itself. Although I was given unlimited access and information about the the hanging of the Paul Morrison show, it was impossible to predict exactly what would happen each day, although at least I could rely on which wall was going to be painted. I am particularly interested in behind-the-scenes action and the video has a lot of activity in it that was happening in the gallery at the same time as Paul’s painting. Also there are some very satisfying symmetries such as the projector being almost coincident with the painting’s black sun, and the backlit moments where the artist and technicians look like they have become part of the artwork. There were all kinds of technical problems to overcome despite the shoot being a single viewpoint. I had two cameras fail – my backup SLR (aka main timelapse camera) and also my “A” compact backup – hence in the picture (top) my “B” compact backup and the “C” backup to the backup to the backup. Light levels changed constantly and a mixture of lighting technologies made white balance a real problem. I had to move the cameras on a number of occasions due to other work happening in the gallery that was nothing to do with me. However, this all comes with the territory of non-critical, observational documentary filmmaking. I was accommodated very generously by Museums Sheffield who found me a desk to work at so that I could edit on-site. Also, the technicians who you see fleetingly in the videos extended me the utmost courtesy. I knew they had accepted me once they invited me to join them for coffee and teacakes, and also when they started making personal insults. Despite the technical difficulties, it has been a real pleasure to work on these two videos and I could not have been more welcomed by the technical, front-of-house, management, curatorial, catering and maintenance staff at Museums Sheffield. It’s just a real shame that I have been paid out of transition funding, provided to soften the blow of the loss of their major funding, and similar opportunities to capture this kind of activity in Sheffield are going to be more and more elusive. Auctorum by Paul Morrison continues until 4th November 2012.